A little more than three years ago, Santa Fe’s self-described “court jester” Christian Englander was so incensed by Dave Chappelle’s onstage ribbing of his “sensitive” artist friend, that he decided to defend said friend’s honor. Did this self-styled wag fire back some quips about Chappelle’s relevance, or explain that his pal Johnny Appleseed (real name) was no rotten apple? No, nothing that dignified—instead, Englander flung a banana peel, which he apparently keeps in his pocket so he can throw at people who just happen to be black, at Chappelle during the set. This so-called humorist was arrested for battery and disturbing the peace after Santa Fe’s mayor vowed to throw the book at him, but was later released when Chappelle refused to cooperate with the prosecution. There’s no word on what happened to the second (black) guy Englander threw a banana peel at that week in 2015, but the wannabe harlequin has moved from heckling Chappelle to suing him. According to The Hollywood Reporter, Englander has filed suit against Chappelle and the person believed to be (or have been) the comedian’s bodyguard for assault. 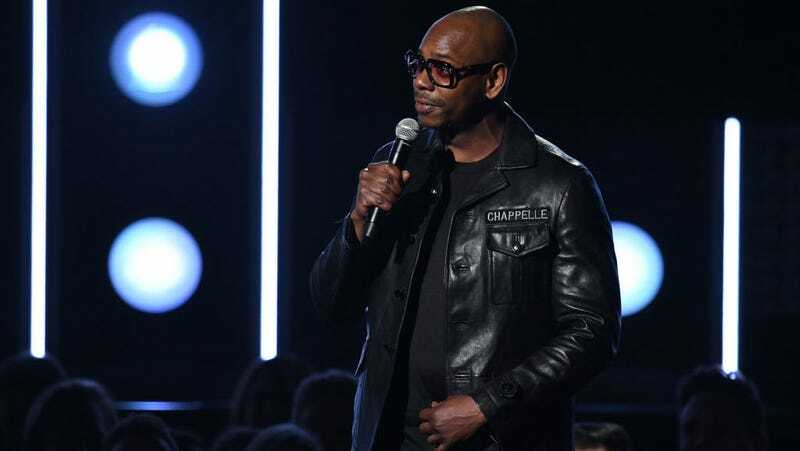 He claims he was “struck twice” while “restrained” by Chappelle’s purported bodyguard. Englander again insisted that, though Chappelle called the assault by fruit a “racial act,” there was no “racial motivation” behind throwing the banana peel at a black comic. A rep for the Equanimity comedian has yet to comment on the lawsuit.